When it comes to looking at the impacts of climate change, ski resorts have a lot to lose. We can’t blame them for the global warming crisis. However, it stands to reason that ski resorts would be at the forefront of environmental best practice. Perhaps even lobbying, campaigning and educating people as much as they could. Similarly, shouldn’t those same ski resorts be the destination of choice for concerned skiers? Unfortunately, it’s not even common knowledge which resorts those are. How do you spot your green resort from your ‘green-washed’ resort? Thankfully, things are now a bit easier. This is largely due to the work of UK journalist Patrick Thorne, who has created a comprehensive review of the green practices of the world’s main ski resorts. Taking a look, you soon realise there is a huge difference in attitudes from one resort to the next. Without further ado, let’s meet the five greenest ski resorts in the world. Avoriaz is a purpose-built resort. 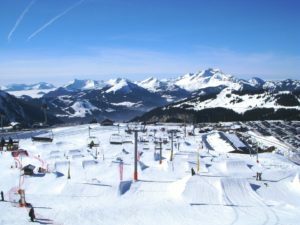 It perches 1850m on a cliff above Morzine, in the heart of the Portes du Soleil. The benefit of being purpose-built is of course the facilities! The resort does have to take credit for their range of comprehensive green measures. Tall buildings even manage to blend into the hillside when you look up from Morzine. From personal experience, however, we have to say that the traffic reduction measures they get a tick for are dubious. There are no roads in the resort – a horse and cart greets arriving visitors – but there is a whopping car park on arrival. Saas Fee, ‘The pearl of the Swiss Alps’ is a stunning little town in the Valais region of Switzerland. It accesses over 100km of skiing, much of it on the Dom and Allalinhorn glaciers. The top elevation is at 3550m. With the exception of a few electric vehicles, the town is also car-free. This fact stretches back to 1951, when the main road there was constructed. Ah Jackson, how you feed the dreams of so many aspiring skiers and powder hounds. Jackson Hole has built a name for itself as the rustic, redneck gateway to extreme skiing in the Grand Teton National Park. That is changing a bit now, due to the family-owned resort’s big investments. New lifts and new runs improve accessibility for beginners. Even so, over half the runs still fall under advanced or expert level. Sustainability is a strong theme in everything that happens there. Perhaps it is no surprise that the Hotel Terra, an LEED-certified eco-hotel, opened its doors there a few years ago. Perhaps better known for celebrity spotting than green credentials, Aspen is a name every recognises. It is actually made up of four resorts: Aspen Mountain, Aspen Highlands, Buttermilk and Snowmass. All of these are tucked up a stunning valley in West Colorado and run by the Apsen Skiing Company. Aspen has been at the centre of green initiatives for years, forcing many others to follow suit. It was the first to buy wind power, the first to offset its energy usage, and the largest photovoltaic system in the industry. All that, with over 250km of slopes to suit all abilities. Probably not a likely destination for many skiers who don’t actually live down under, but good to see the Aussies getting in there. 250km Northeast of Melborne, Mount Buller rises up to 1805m, offers a vertical drop of 400m, and has an impressive 100km of slopes. When the snow is good, the skiing is a lot of fun! 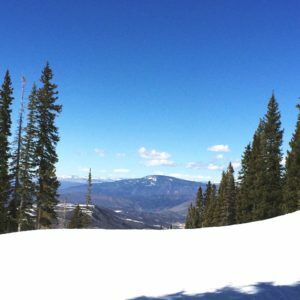 Ski Resorts: How was This List Developed? It is impossible to provide a perfect comparison of each resort. This is largely because the local issues are so different wherever you go. Resorts were therefore rated according to a series of factors that are comparable in nature. These are: recycling, green power usage; traffic reduction policy; waste reduction policy; climate policy (resort-wide strategy for CO2 reduction); green building policy and whether the resort is ISO 14001 approved (the global voluntary standard for environmental performance).